Airborne cakes, champagne showers, acrobatic crowd surfing and lastly, rafting on the dance floor. Yes, we’re talking about a Steve Aoki concert. The Dim Mak general is set to embark on a three-city tour later this month to officially be a part of the first Vh1 Supersonic Arcade of the year 2015 taking place in Mumbai, Delhi and Bangalore on the 16th, 17th and 18th of January respectively. The Japanese-American electro house maestro is best known for his on-stage antics than the music he produces, and he will be set to mesmerize the Mumbai crowd for the second time now, after being part of the Enchanted Valley Carnival opening party last year. Regarded widely as one of the foremost EDM artists, Aoki has collaborated with most of the biggies in the business, namely Tiesto, Hardwell, Avicii, Nervo, Laidback Luke and Afrojack. He also has a record label to his name, Dim Mak Records, which he started back in 1996. The label has signed some of the most sought after and fascinating talents in the dance music industry like Coone, The Chainsmokers, Deorro, Zedd, Chocolate Puma and Borgore. With an average of 250 shows worldwide in a year, Aoki is one of the most busiest DJ’s around and makes the most of his touring by playing some of the most energetic tracks during his live shows. His on-stage antics coupled with some extremely vivacious tracks make his concerts unmissable. The Grammy nominated DJ has been designated as the highest grossing dance music artist in North America in 2012 by Pollstar. He was also bestowed with the Best Set of the Season at the Ibiza Awards in 2007 and has released several Billboard-charting studio albums too. If you still haven’t been convinced to attend his concert, a recap of what went down the last time he visited India is surely going to change your mind. 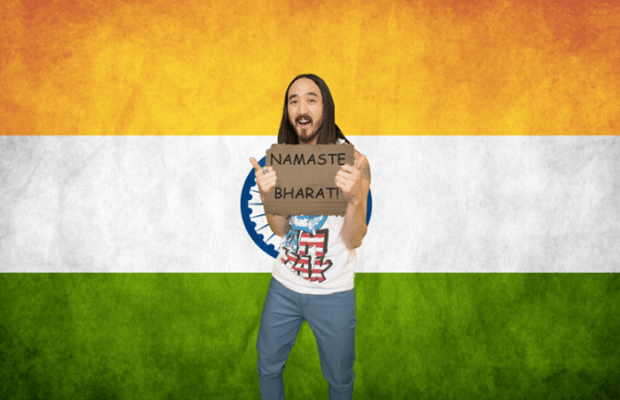 Steve Aoki is coming to India! Delhi – Kingdom Of Dreams, Gurgaon. Next article Dimitri Vegas & Like Mike to produce music for Salman Khan!